Habit: Shrub < 30 dm, from thick trunk, gray-hairy. Stem: generally glabrous. Leaf: 1--3(6) cm, generally wedge-shaped, generally (0)3(5)-toothed or lobed at tip, often in axillary clusters, persistent, gray-green, densely hairy. Inflorescence: heads discoid, 1--3 mm diam, generally erect; phyllaries oblanceolate to widely obovate, densely tomentose, margins +- transparent. Pistillate Flower: 0. Disk Flower: 3--6. Fruit: 1--2 mm, glandular or hairy. Chromosomes: 2n=18,36. 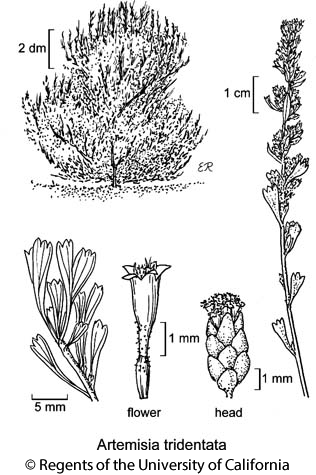 Citation for this treatment: Leila M. Shultz 2012, Artemisia tridentata, in Jepson Flora Project (eds.) Jepson eFlora, http://ucjeps.berkeley.edu/eflora/eflora_display.php?tid=1249, accessed on April 24, 2019.